On Monday the Dow dropped 130 points on more European debt concern, this time a Standard and Poor’s downgrade of Italian debt. Weak manufacturing and service sector reports coupled with an increase in new-home sales in April led to a slight delcline in stock prices on Tuesday. The market rebounded slightly on Wednesday, ending a three-day losing streak. On Thursday, stocks once again logged a small gain despite a rise in jobless claims. However, the declining volume as the long Memorial Day weekend approaches makes it difficult to attach any significance to stock movements. Volume plummeted dramatically on Friday with stocks making slight gains to finish off the week with a loss. The Dow and S&P 500 suffered a fourth consecutive losing week. The S&P 500 (-0.2%) could not quite make it to the positive, while the Russell 2000 (0.9%) managed a gain. Investor return can be very different from the widely quoted figures for total fund return. For example, the top-rated Fidelity Leveraged Stock fund has an annual return over the last 10-year period of 14.5%. However, the average investor in this fund had an average annual return of only 4.0%. The reason for the gap is, most investors didn’t buy and hold for the 10 years. 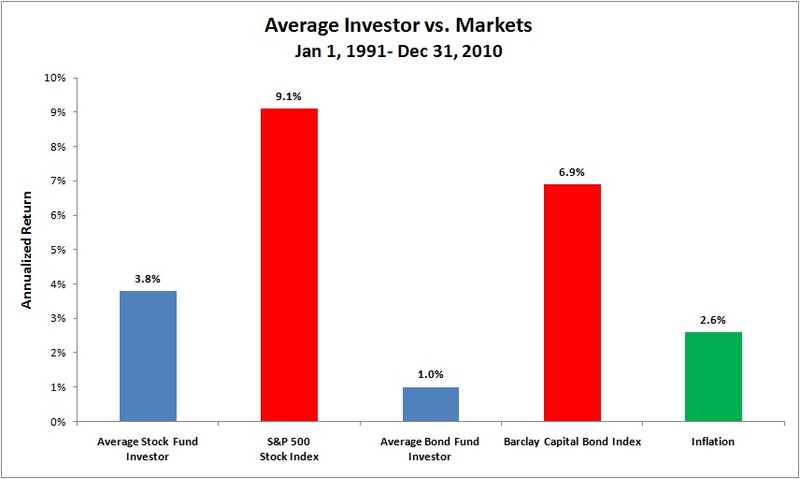 Instead, the average dollar in the portfolio stayed invested for short periods. Many studies have shown that long-term shareholders receive the best returns. Stocks ticked downward on Monday on renewed concern over the health of the recovering economy following weak manufacturing and housing reports. On Tuesday the Dow took a heavier hit than the NASDAQ and the S&P 500 as more concerning news over the health of the economy continues to cast a shadow on the market. Stocks snapped back on Wednesday when the Federal Reserve minutes indicated that the Fed will not change their monetary policy in the near future, preserving low interest rates for the time being. On Thursday, disappointing manufacturing and home sales reports were more than offset by exuberance over the doubling of networking website Linkedln’s stock price on its first day of trading after its IPO. Stocks retreated moderately on Friday following a downgrade of Greek debt and disappointing earnings and sales reports from Gap and Aerepostale. It was an over all down week for stocks owing to Friday’s poor performance. Is Your Money Safe With Your Broker? Michael Hogan, CEO of FOLIO Investments Inc., helps answer this important question. By the way, FOLIO is the custodian and clearing broker for NorthStar Capital Advisors. When fraud is involved, it is generally with introducing brokers who are able to cash your checks, and create a set of fake books. It is nearly impossible for clearing brokers to commit fraud. Get access to the clearing broker’s website so you can see your account. Is Your Money Actually Safe With Your Broker?http://www.businessinsider.com/is-your-money-safe-with-your-broker-2011-5When Lehman Brothers went bankrupt in September 2008, most investors faced a question they had never considered: Is my money safe with my broker? Exuberance over last week’s very positive non-farm payroll report still lingered on Monday, leading stocks to a half-percent gain on Monday, as oil prices exceeded $100/barrel once again. On Tuesday news of Microsoft’s $8.5 billion buyout of Skype propelled the market to another solid gain. Monday’s and Tuesday’s gained were effectively erased on Wednesday as the Euro dropped on further concern over Greek and Portuguese debt. On Thursday the seesaw market action continued with another half-percent gain following a morning swoon in stock prices. Greece’s debt weighed on the market once again on Friday, outweighing a positive consumer sentiment report. The major indexes finished down over a percent. Stocks finished the week largely unchanged despite rather large swings throughout the week. According to Fidelity, the average balances of 401(k) retirement accounts reached the highest level since Fidelity started tracking account values in 1998. 10-year continuous participants have an average balance is about $191,000. Participants age 55 years or older and are 10-year continuous participants have an average is about $233,800. Participants saved an average 8.2 percent of their salaries. Americans held $3.1 trillion in 401(k)s as of Dec. 31. Average 401(k) Balances Reach Highest Level, Fidelity Sayshttp://noir.bloomberg.com/apps/news?pid=newsarchive&sid=aUstRNlUBCL4May 11 (Bloomberg) — Average balances of 401(k) retirement plans reached the highest level since Fidelity Investments began tracking account values in 1998. Monday kicked off the trading month of May with a whimper with stocks registering minor losses despite the previous night’s news of the death of Osama bin Laden. It was another day of modest price movement on Tuesday as the dollar hit an all-time low versus the Swiss franc. On Wednesday the market suffered a more significant loss on disappointing manufacturing and private-sector jobs reports. Wednesday’s close marked the first time since October 2008 that the stock market lost ground over the first three days of the month. The decline continued on Thursday with a surprising uptick in new claims for jobless benefits weighing down stocks. Friday marked the one year anniversary of the May 6, 2010 “flash crash” that shook the markets at the time. This year, however, stocks rose moderately following a nonfarm payroll report that showed an increase of 244,000 jobs in April. Conversely, April’s unemployment rate rose to 9.0% from 8.8% in March. Friday’s gain was not enough to erase the week’s losses, with small-cap stocks suffering much more than large-cap stocks. Do you have bad investing habits? Don’t be forgetful or lazy when it comes to your money. Watch out for clutter in your portfolio.